Today I had lunch at Dinner by Heston Blumenthal. I'm no restaurant critic but it was a truly wonderful meal. The menu is full of surprises and combinations you wouldn't imagine. The infamous meat fruit is charming, incredibly realistic and delicious. I went with my friend Helen (it was our bon voyage lunch - she's about to go off on a long trip) and her main of chicken with cooked lettuces sounded a bit odd but oh my - I'll never question cooked lettuce again. All of the dishes needed to be balanced on the fork. Eating one element alone often didn't quite work, but when you had a little of everything - BAM. The brown bread ice cream with salted butter caramel and malted yeast syrup (and a touch of apple and lemon) needed careful balancing. The most magical part of it was that every bite is different - each one a unique combination. It seemed to evolve as you ate. As a final 'sweet taste' we were given tiny pots of Earl Grey ganache (made with a mixture of milk and dark chocolate) and a long finger of a shortbread-esque biscuit, flavoured with caraway seeds. I've never tasted a sucessful Earl Grey dessert before. I've never tasted caraway in a sweet dish before. Each element was delicious, but together? The combination totally blew me away. It seems so unlikely and difficult to imagine but they blended and enhanced each other perfectly. 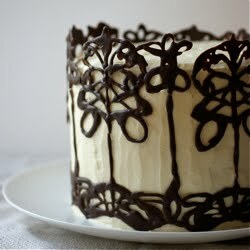 This cake also works on an unusual-but-good combination. I chose the recipe because I was intrigued by the ingredients. Lots of treacle, sunflower oil, wholemeal flour, ginger, lots of raising agent and parsnip? As I was putting it together and baking it I was pretty unconvinced. Yet I liked the first slice. The second? Even more. It just keeps on growing on me. I can only really describe it as dark gingerbread with a nutty taste. The drizzle adds a lovely contrast. It's perfect with a cup of tea and a book (I'm currently addicted to an Icelandic Saga to the point that I missed my tube stop this morning because I was so entranced). 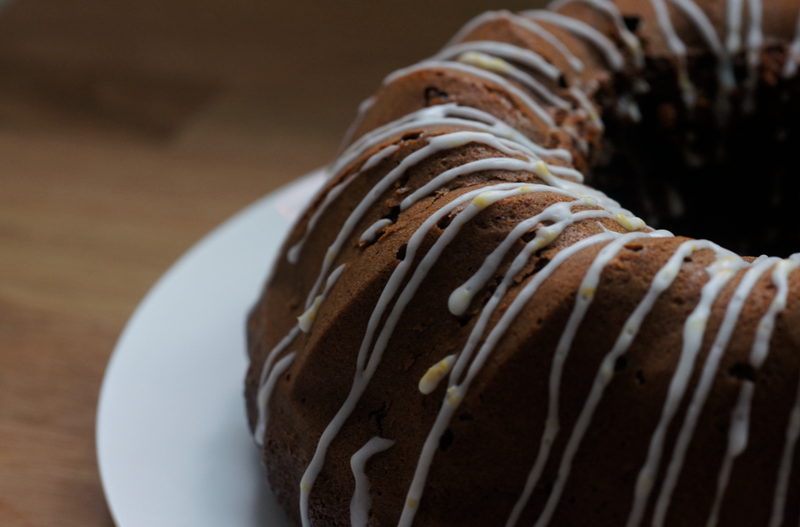 Carefully grease a bundt pan with butter and dust with flour, making sure you get into the cracks and don't forget the central funnel (you can also use a normal 20cm round cake tin - line it with greaseproof paper). Preheat the oven to 180C (160C fan). Separate one of the eggs and set aside the white. Place the yolk and the other egg into the bowl of a stand mixer with the dark brown sugar and whip for 5 minutes - the mixture should be paler and have increased in volume. Add the treacle and oil and whip again until smooth and fully combined. 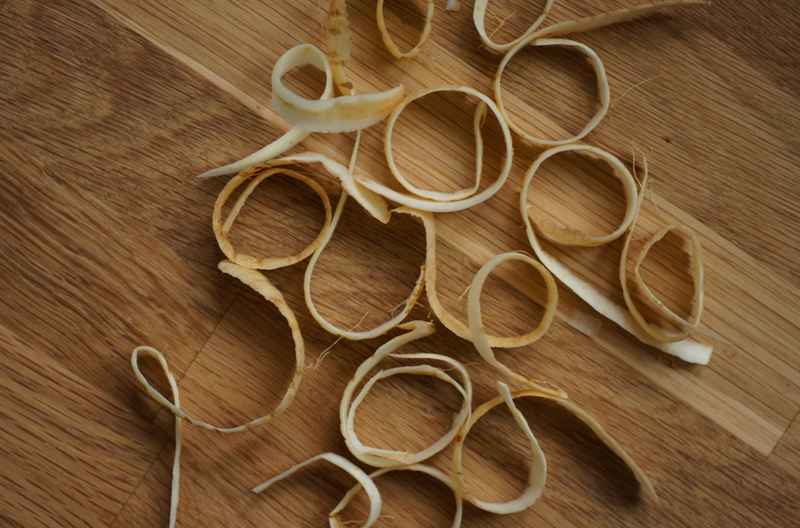 Add the parsnip and ginger and stir to combine. Sieve in the flour, wholemeal flour, baking power, bicarbonate of soda and ground ginger and fold in. Finally whisk the remaining egg white to soft peak and gently fold into the mixture. Spoon into the prepared tin and bake for 25-30 minutes, or until a skewer can be inserted into the middle and come out clean or with a few small crumbs. Turn out immediately and let the cake drop down from the pan in its own time (a little boiling water can be poured onto a towel to place underneath the rack if you like - the steam seems to help it unmould). While the cake cools, sieve the icing sugar into a small bowl. Finely grate the lemon into the bowl. Add the juice litle by little until you have a smooth icing that dribbles off the spoon. Place the cooled cake onto a plate. Either drizzle onto the cake with a spoon or place in a small piping bag. *Dan suggests you can also use swedes or turnips. You can also use 100% wholemeal flour instead of a mixture. You're right- so many unusual ingredients here. Not too sure about the parsnips though?! Hope the course is going well :) Loving the Instagram photos on Twitter. Dan's book is such a source of inspiration - I've not yet tried this recipe but definitely want to give it a go now! I saw a parsnip cake recipe in the book, In The Sweet Kitchen but it had to go back to the library before I tried it. But I was certainly intrigued (as I obviously remember it!) This one sounds equally interesting. I love gingerbread so I may have to give it a try. Being in the US I presume I would be using molasses rather than treacle; I'm sure it's similar enough to do the job! Thanks for sharing. (ps enjoying your instagram feed too). thelittleloaf - It's a great book, I'm looking forward to trying other recipes. And 2 puddings is great - you get to taste more pudding and it's considerably cheaper! Sara - Ooh sounds interesting. I had an email about the treacle/molasses earlier - I think they will substitute for each other. Black treacle is pretty dark and bitter - don't know if your normal molasses is - so maybe add a bit of blackstrap too. Good to know you're enjoying the instagram! This looks exciting, I am having fun experimenting with gingerbread flavors this season. I love your drizzling technique! my goodness this looks yum! 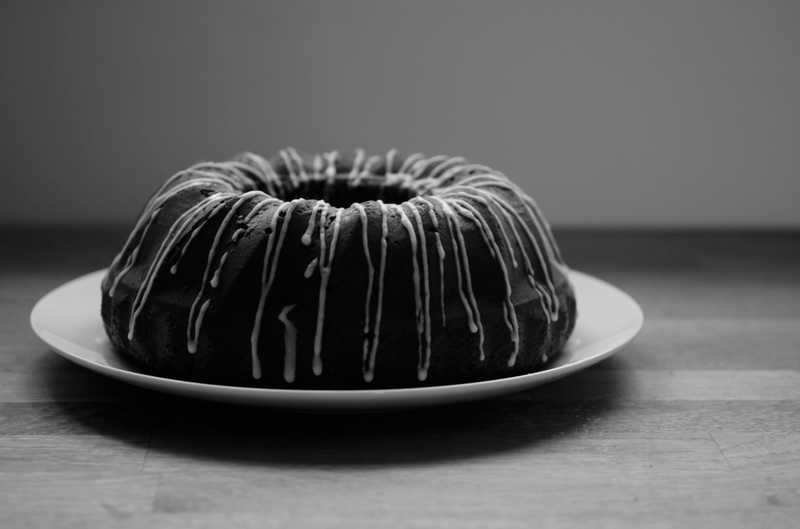 i feel that i am in need of a bundt tin... do they do anything to affect the texture of the cake? or do they just make prettily-shaped cakes? i think i just like saying the word 'bundt'. Sue - Experimenting with gingerbread flavours sounds like a lot of fun! Glad you like the drizzle. Christine - Thanks, just a shame you don't have a parsnip option! Angela - Get one, they're great! I don't think they do much to the texture really. They do cook faster than a normal round tin though. The true sign of a good book is when it causes you to miss a tube stop. I am intrigued by Dinner by Heston, I've been to the Fat Duck and while I would massively recommend it and enjoyed it I wouldn't go back or say I particularly liked much of the food! Dinner sounds much more do-able. I made this cake but half way through the process I realised that I didn't have any black treacle- so I substituted a tablespoon of golden syrup. It is much lighter in appearance. 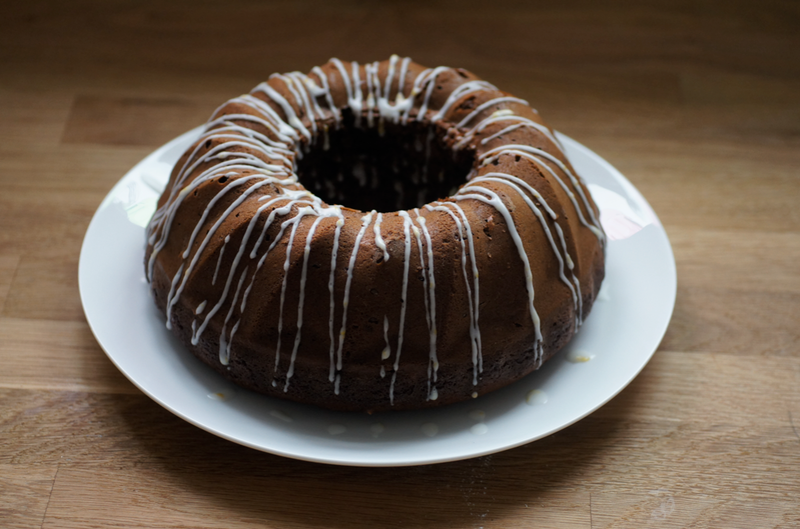 I also didn't have a bundt tin so I used my round angel cake tin and that worked well. It was a great success- moist and very tasty. I've been eying that recipe up since I got the book. Parsnip I can get my head around, but swede? The Food Programme today was all about experimental food and challenging our taste buds and conceptions - it's all very interesting. Your cake looks very pretty. 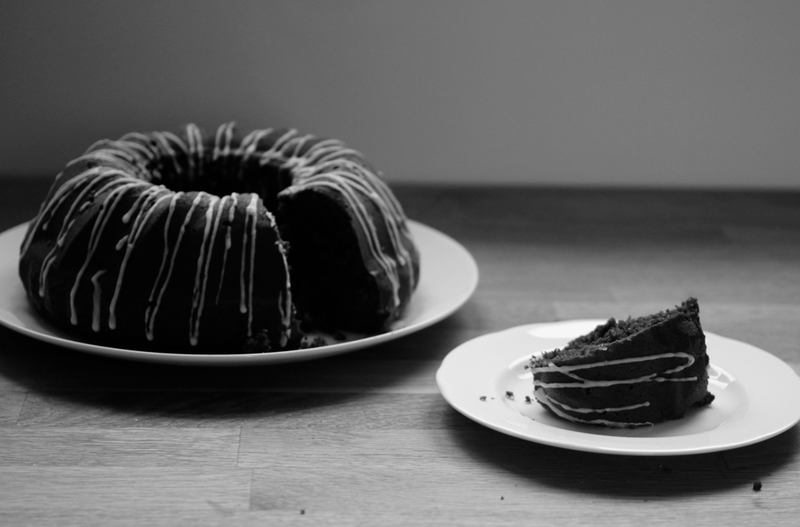 i think i shall invest in a bundt tin. they just make cakes look so much dressier, and, if i dare to use a bad pun, so much more "hole-some"! oh dear. regretting that one already. Alex - Definitely - I nearly did it again yesterday with the same book. Interesting you say that about the Fat Duck. I've never been, but both of the big 2* tasting course menu type meals I've had were wonderful but I don't think I'd go back. One was too perfect and I'd hate to ruin the memory and the other I just can't imagine doing again. They're definitely once in a lifetimes things. Dinner is a place I'd love to return to again and again - while I was sitting there I was thinking how different that feeling was to the big meals. Mum - Glad you enjoyed it & good to know about the golden syrup. Choclette - I know - swede is even weirder!! Turnip too. That program sounds interesting, I'll have a look - thanks for pointing it out. Interesting, I might put Dinner on my list of places to go. Alex - You should! It's definitely worth a visit. Sarah - I'm afraid this one is from our Swiss supermarket, Migros. Still, lots of good ones floating around in cookery shops. I love baking in it.